Under the GST regime, we have the basic 3 kinds of taxes. Certain categories of registered persons are required to deduct taxes and deposit it with the government. 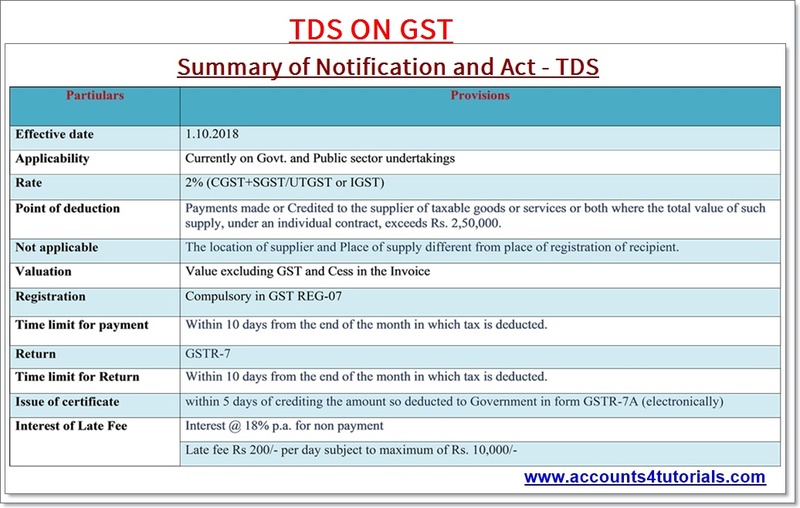 Let’s try to understand TDS related procedures under GST. Section 51 of the CGST Act, 2017 (i.e. Tax deduction at source) applicable from 1st October 2018. Form and manner of furnishing details of inward supplies. Form and manner of submission of return by a person required to deduct tax at source. (d) such persons or category of persons as may be notified by the Government. (ii) established by any Government, with 51% or more equity or control by the government. (b) The society established by the Central Government or the State Government or a Local Authority under the Societies Registration Act, 1860. > where the total value of such supply, under an individual contract, exceeds Rs. 2,50,000. Different from the State or UT of the registration of the recipient. At what Rate TDS to be deducted? On which Value TDS to be deducted? The value of supply is to be taken as the amount excluding the tax and cess indicated on the invoice. 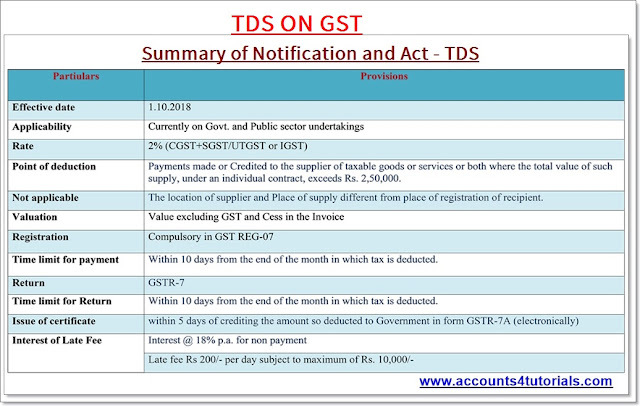 This means TDS shall not be deducted on the CGST, SGST/UTGST or IGST component of invoice. Supplier A makes a taxable supply worth Rs. 3,00,000 to B. The rate of GST is 18%. He/She will pay Rs. 2,94,000 (worth of Supply) + Rs 54,000 (GST) to A and Rs. 6,000 (RS. 3,00,000*2%) as TDS to the government. So it can be said that TDS is not deducted on the tax element (GST) of a transaction. Applicants not having PAN can apply on the basis of existing TAN issued under the Income Tax Act. When should the TDS be paid? Within 10 days from the end of the month in which tax is deducted. How and when to file the TDS return? File TDS return in form GSTR-7 within 10 days from the end of the month. When GSTIN of the unregistered supplier is not available, their name can be mentioned. The robustness of the system reflects these filled-in details in the electronic ledger of the supplier. When and how to the issue of TDS certificate? The deductor shall furnish to the deductee a certificate. In Form GSTR-7A (made electronically available), - Rule 66(3) of CGST Rules. Within 5 days of crediting the amount so deducted to Government. How can the deductee (Supplier) can claim TDS? The deductee can claim credit in his electronic cash ledger of this tax deducted and use it for payments of other taxes. - Section 51(5). Is it possible to get refund of TDS under GST? If any excess amount is deducted and paid to the government, a refund can be claimed. If the deducted amount is already added to the electronic cash ledger of the supplier, the amount so added cannot get back as a refund by the deductor. Deductee can claim a refund of tax subject to refund provisions of section 54 the act. Is there any Interest / Late fee for non-compliance?